The end results you see on the chart are based on experts that know exactly what is required to produce profitable crops. Do you know who the experts where? They are the crops grown in this type of soil composition! You have probably heard me say it more than once and here I go again, there are three things that don’t lie to you: soil, plants and animals. They have no political agenda, no financial obligations to perform and no egos to satisfy! Let’s look at what the soil has to offer us when these proportions in the soil profile are in place. The 46% mineral content plays an important role in the scheme of the soil environment. It contains all the major and minor elements that are presented on the soil samples. The soil sample is based on the top six and two third inches of top soil. The mineral content may be the largest soil attribute but is not the biggest limiting factor in crop production. It is a composite of all that is in your soil profile. Now how do you tap into these reserves without depleting them? One of the answers is to grow a high yielding, high quality organic matter crop! That last statement is contrary to popular expert opinions. Our understandings from soil samples observed over the many years in providing soil nutrition for growing a crop has yielded higher fertility levels after the crop was harvested, which is the opposite of the “balance sheet theory”. You are supposed to put back what the crop took out! Which has been scientifically proven false since it conception. Theory is a best guess as to how man thinks it works! The next one to look at is water. 25% of your soil could be water in a desirable level at all times to supply that essential ingredient in the recipe for a successful crop. The crop depends on it for its ability to absorb nutrition from the surrounding soil environment. The living soil organisms cannot and will not function without its rejuvenating, replenishing source of energy. Hydrogen in the water chemistry feeds all different forms of bacteria, fungi and molds to help them as an energy source and the pure chemistry to create organic acids that feed your plants root systems. The root is very successful when the environment around it has a supply of water. The plant needs this water to absorb the transforming chemistry being created by the living portion of the soil organisms. The soil organisms feed the plants root system via the water. The plants roots absorb nutrition into it roots in a “water soluble form”. Earthsoils products are all water soluble allowing absorption directly into the plant. The nitrogen, four forms of potassium phosphate, trace elements of Zn, Mn, Cu, Fe, Mg, B, S, Ca enter into the root digestive track for easy assimilation. The chemistry that is created by your plants from this point on is just plain incredible! I will condense it so that I can even understand it. The postage to describe the processes occurring in a single plant and its relationship with the soil would keep the post office busy full time! The plant absorbs the nutrition it wants in through its root systems and brings them to all the functioning parts of the plant. The plant takes in water, nutrition, carbon dioxide from the air and soil, and this chemistry is hit with sunlight and the plant creates sugar and a valuable by product called oxygen. It does it all daylight long and deposits its manufactured sugar back down to the root system, exits out into a moist environment and that sugar feeds the micro biological system the energy it needs to transfer more nutrition back into the plant to create more sugar and oxygen. Someone should be given a lot more credit for His Grand Designing Abilities! Nothing lost in this incredible process but everything has gained! If by any chance I am boring you with facts you already know, great! I’ve got a zinger coming up you probably were not looking for. 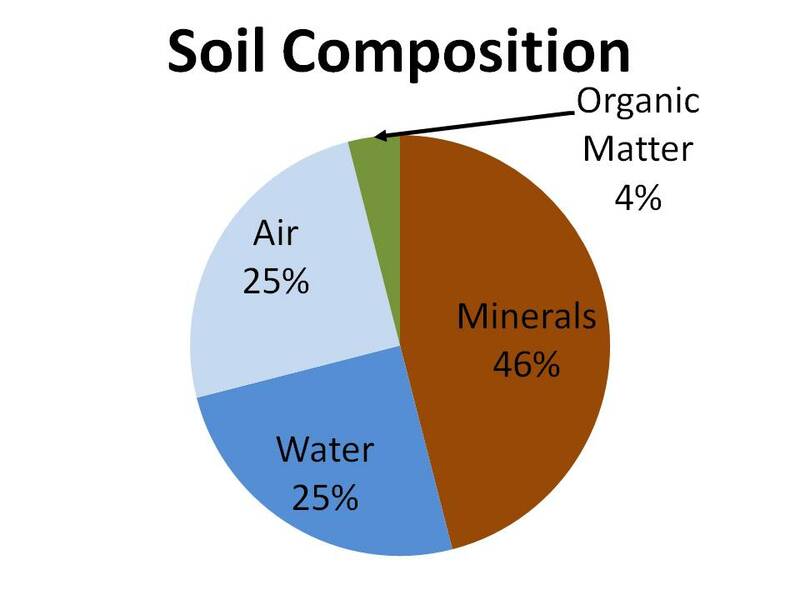 The other portion of the above chart shows a 4% organic matter content as being ideal. Now that is not the case in many soil types from different areas. Don’t be upset because you don’t have this level of organic matter. Organic matter is any material left behind in the soil that can be decomposed into humus and redesigned into plant food material for the upcoming crop production. The higher the levels of mineral content in the form of complex sugars, proteins, carbohydrates, digestible fibers, enzymes and amino acids, the better the food material there is available for the living portion of the soil to utilize for manufacturing plant food for your crops for the following years to come. Organic matter is literally a house that bacteria will eat themselves out of. Organic matter is holding our soil profiles in place. It acts as a sponge to hold moisture for longer periods of time for plant use. Organic matter can be said to be one of the most important ingredients into crop production. The question that enters my mind in the fields that have had long durations of GMO crops is, “When is the soil going to completely reject the organic matter food supply and completely shut down with beneficial microbiological supporting systems?” I suggest choosing hybrids that fit your farming practices and ones that will help fortify your soil’s digestive track! If your organic matter is having a difficult time breaking down into humus through natural occurring processes, then I’m afraid you are not getting back from your genetics the nitrogen, phosphate, and potassium you used to rely upon for increased fertility levels. Organic matter is a huge contributor to fertility levels! I have poured a 1000 # of phosphate on an acre of ground and lost phosphate levels! I have grown oats and plowed them in when 2 feet tall and just about doubled the useable phosphate levels in the soil! There is a direct correlation between excellent organic matter offered to your soil environment and yields, soil tilth, water holding capacity, disease resistance, reduced erosion and most importantly, you remaining on the farm to be the steward of the soil that you are! The last ingredient to mention in the chart above is the oxygen content. 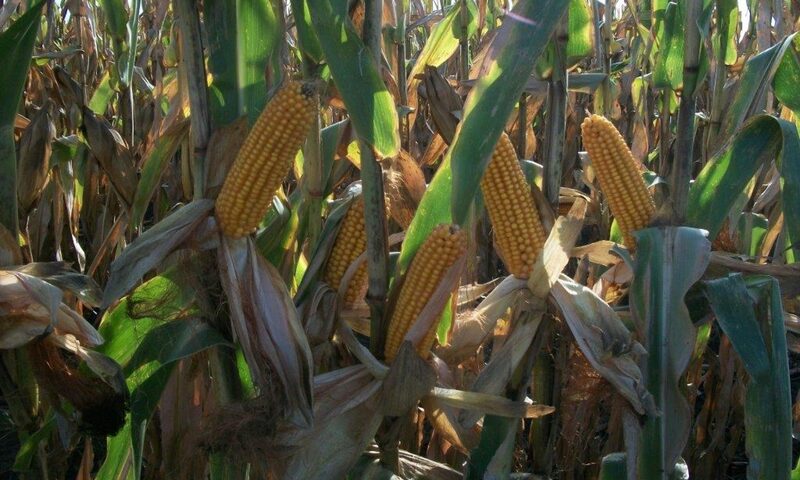 It has been found that an extremely beneficial level to be at for overall crop production is 25%. The scientific researchers that came up with that figure were not listening to modern day experts! No, they did not listen to the experts of today, they listened to the plants that outperformed everything else based on 25% oxygen content. There was not only more yield but less disease problems, healthier standing plants through harvest, less nitrogen input costs, less stock rot, more nitrogen nodules placed on soybean root systems, less weed competition, more earthworms present, less soil compaction, bigger leaves on all crops and the beat goes on! I’m dating myself here but I mentioned the “beat goes on”, it was a song by Sonny and Cher. It was a hit in my younger years and it still is—maybe I’m still young at heart! The oxygen content in the soil is the very thing that allows the heart beat in the soil to pound away with incredible rewards! I’m going to run a little experiment with you right now. I want you to pick the time and the place to do this. Take a few deep breaths (one pass field cultivation in the spring) and when the second hand reaches 12(the first day you plant) hold your breath for four minutes (the day you fall till your soil) and lets see how you feel during the growing season. Did you make it holding your breath past one minute’s time? Thirty seconds? Hold your breath until you feel the discomfort of wanting oxygen. I don’t want you to commit me to the funny farm for running this experiment, but I would like you to place yourselves in your soils’ environment for one single minute during the growing season! Could you produce results up to the maximum abilities without air? You know as well as I that air is pretty important in our life right now. Wouldn’t you agree? It gets real uncomfortable in the position of not functioning without it. Your whole body relies on that breathing in and letting it out to function in a living world. Your soil relies on oxygen to stay alive and well, also. There are so many exchanges involving chemical reactions within the soil requiring oxygen it would be impossible to mention them all and science is discovering more as we speak. Oxygen in the soil profile is essential for aerobic bacteria to perform their magic of converting organic matter into plant food materials. They create humic acid which not only feeds the plants but protects your root systems from predators, disease and potentially devastating aflatoxins, a mycotoxin mold! They all need the presence of the oxygen for you to have the crops you have planned for the growing season. There are a lot of different tillage practices in place, every farm has their own. Our products and program will work with any of them as long as you keep in mind how it feels to hold your breath for four minutes. When the soil has had a heavy shot of rain then soil can develop a crust to it that can seal the soil from receiving any benefit from what oxygen can provide you and your crops. Interesting research that I came across just lately was the fact that when you open up the soil thru row cultivation it releases carbon dioxide from the soil profile and the bottom leaves absorb it so fast hardly any of it was lost. Remember, carbon dioxide plus water and sunlight create sugar. The plants feed the sugar to the living portion of the soil so that it can be fed nutrition as it wants it. The bacteria do their thing and create more carbon dioxide from their activities of feeding the plants roots (we breathe out carbon dioxide), which in turn is released from the soils and the plants reabsorb the carbon dioxide and convert it to sugar again! From this point on it should be self explanatory. It doesn’t get any more exciting then this when it comes to understanding how well balanced our ecological system has been designed. Hats off again and again to the Grand Designer! Again, in trying to describe how important oxygen is to the soil as it is to us I will go back to a time when my Dad, as well as many of your own, relied on the cultivator as a weed controller. It was interesting to watch his fields turn a richer darker green after opening up the soil. I can’t forget the Moms and their gardens! When it rained it meant I had better get the hoe sharpened. Why now? Cause when it dries out you will hoe the garden to get the weeds that are growing and some air back to the plants so they can breathe! I knew what my job was going to be way before the sun came out and before the bike pedals found their way to the newly refreshed creek of water west of the farm. The plants just exploded after the rain and the addition of oxygen for Mom’s plants to breathe! I’ll just bet these same experiences are coming to mind about now, and it still works to this day! Earthsoils customers everywhere: It just that simple. If in doubt, hold your breathe to see how your soil is feeling and react accordingly!